Dormont 25gpm flow rate with 50 lb capacity grease interceptor. 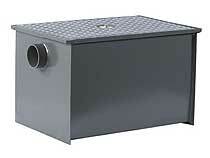 Epoxy coated 11 gauge steel grease trap. Gasketted solid steel cover with hex bolt and removable baffle assembly. Deep seal trap with cleanout. No hub assembly and external cast iron flow control fitting. PDI Certified.